Ants are one of the most successful groups of insects in the animal kingdom and are of particular interest because they are a social insect and form highly organized colonies or nests, sometimes consisting of millions of individuals. Colonies of invasive ant species will sometimes work together and form supercolonies, spanning a very wide area of land. Ants have colonized almost every landmass on Earth. 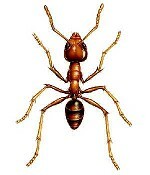 Carpenter Ants are large black or rust colored ants. They usually dwell in and excavate wood, thus their name. The debris from their excavation looks like small piles of sawdust. Carpenter ants prefer soft, wet, rotted wood, and although their natural habitat is woodland areas, they frequently invade homes. Once they are detected they should be treated as soon as possible. Presence of ants: Continuous or numerous ants are a sign of nesting. Sawdust: Accumulating in piles or caught in spider webbing; has a finely-shredded appearance. Trails: Ants move along definite trails by following a chemical scent or visual clues. Pharoah ants are found throughout the United States. There colonies can become very large, numbering in the hundreds of thousands. Typical nesting areas include wall voids, baseboards, in furniture, near hot water heaters and heating systems. Outdoors, they are likely to nest near the house or in a garden or lawn. These ants have a diverse array of food choices. They prefer sweets, greases, meat, blood and insects. Although it is not uncommon for them to feed on such items as shoe polish and sponges. These tiny ants will set up quarters in the ground, in cracks in concrete walls, in spaces between boards and timbers, even among belongings in human dwellings. The worker ants are only about 1.6 mm (1/16th inch) long. They can easily squeeze through cracks and holes no more than 1 mm (0.040 inch) in size. Queens are two to four times the length of workers. They are attracted by electrical currents and are known to have caused damage to air conditioners, heat pumps, telephone junction boxes, traffic lights, gasoline pumps, and so on. When they become lodged or electrocuted between the contacts of relays, it damages the contacts and causes the equipment controlled by the relay to malfunction. The Red Ant (also known as the Fire Ant)is a native species sometimes called the Tropical Fire Ant. This ant ranges from South Carolina to Florida and west to Texas. This native red ant usually nests in mounds constructed around clumps of vegetation, but may also nest under objects or in rotting wood. Red Ants only bite to get a grip and then sting (from the abdomen) and inject a toxic alkaloid venom. For humans this is a painful sting – hence the name fire ant – and the after effects of the sting are deadly to some individuals.